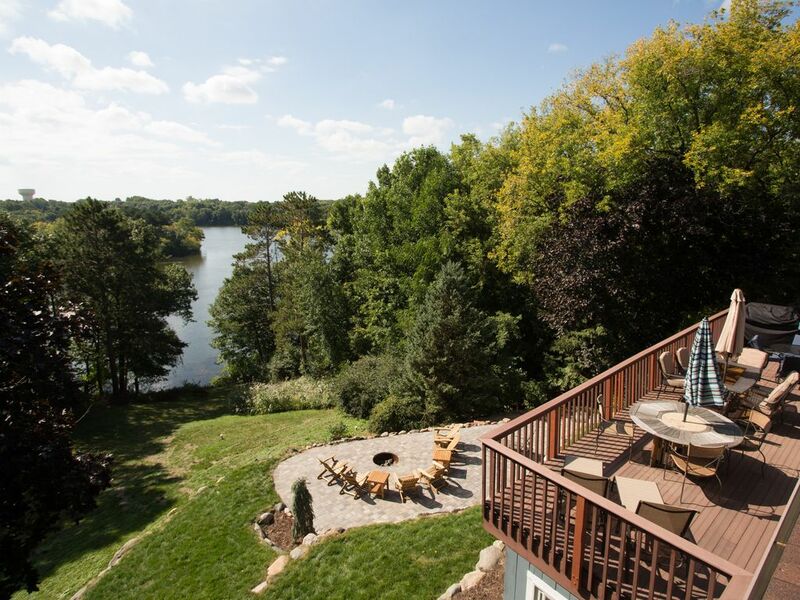 This modern lake home has been totally remodeled to provide all the creature comforts of home while allowing you to take in all that nature has to offer. The 8 person hot tub and 500 square foot fire pit patio are available year round! The house provides a great opportunity to get away from the pressures of life for either a couple of days or for a week or more. The location is perfect as it's so close to the Minneapolis (20 min) and St. Paul (10 min) yet secluded enough that you would never know it. The house has 6 bedrooms and 2 bathrooms. There is a natural gas grill on the deck which is always ready. There is seating for 12 on the deck. There is a wet bar with a door leading to the patio for hot tub parties. Check in time is 3 PM and check out time is 10 AM. I own a landscape company in Woodbury that I started with my brother as a kid. I love renting my house out to let other people enjoy it as much as I do. This home is my dream home. I am a single guy and I someday hope to raise my family here. In the meantime, it's awfully big for me so I rent it out on VRBO. This house has been completely remodeled with everything updated. I spent 2 years renovating the house and I hope you enjoy it as much as I do. As neighbors are close by and expect to enjoy their home in peace and quiet, if your group becomes so loud or disruptive that the neighbors feel that they need to call me or the police about it, there will be a damage claim of $200.00 to be deducted from your security deposit. Additionally, your group may be asked to leave at whatever time this occurs and there would be no refund of what you have paid to complete your stay. As you expect peace and quiet at your home when you are there, please extend the same courtesy to my neighbors so that I can continue to offer this great home to others such as yourselves. There are cameras that are only focused on the entrances to the house and NOT inside the house in any way. Absolutely perfect for our business retreat!! Beautiful house with everything you need!!!! We will definitely be coming back!!! We had 13 people sleep over with very comfortable accommodations. Great space for our team training with breakfast and cocktail bar setup. Worked out so great!!! Then relax later and enjoy the hot tub!!! Super nice place!!! My sisters and our daughters spent the weekend in this gorgeous home, and during our stay several commented on how ideal this place is. Not only is it a beautiful lakeside home, but it is also obviously well cared for, and many thoughtful touches were included from soft towels to a well-stocked kitchen. We couldn't have chosen a better place to stay! If you have a big family for several days, it is an absolutely wonderful place to stay! The lake view from the house with a fire blazing in the fire place or fire pit, or while sitting in the jacuzzi was incredible! We would recommend a couple of more comfortable chairs to sit in the upstairs floor by the window facing the fireplace. Otherwise no complaints. My group of high school friends had the pleasure of staying here for a girls weekend. The house appears to have been remodeled recently as it all seems very new and clean with beautiful trendy decor. We loved the bathroom upgrades of heated tile floors, rain shower faucet heads and soap dispensaries. The house had everything we needed- we just wished the weather had been a little warmer so we could have enjoyed the beautiful fire pit and lake view. Thanks! As soon as you enter the door, your world is transformed into a cabin like setting but with a super modern twist to the decor. Great little getaway and you don't have to drive 4 hours to get there.